The Columbus Indiana Architectural Archives (CIAA) traces its history to 1967 when John Ross West began to collect materials related to Columbus’ modern architecture. West, a Columbus city planner and a member of the Bartholomew County Library Association, worked with fellow city planner Dean Smith. The goal was to make the materials available to the public in the newly constructed Cleo Rogers Memorial Library (Bartholomew County Public Library's main branch). By 1969, Columbus boasted nearly thirty modern buildings, of which twelve were designed with support from the Cummins Foundation Architecture Program. That same year West sought the help of J. Irwin Miller who was the Chairman of Cummins Engine Company at that time. 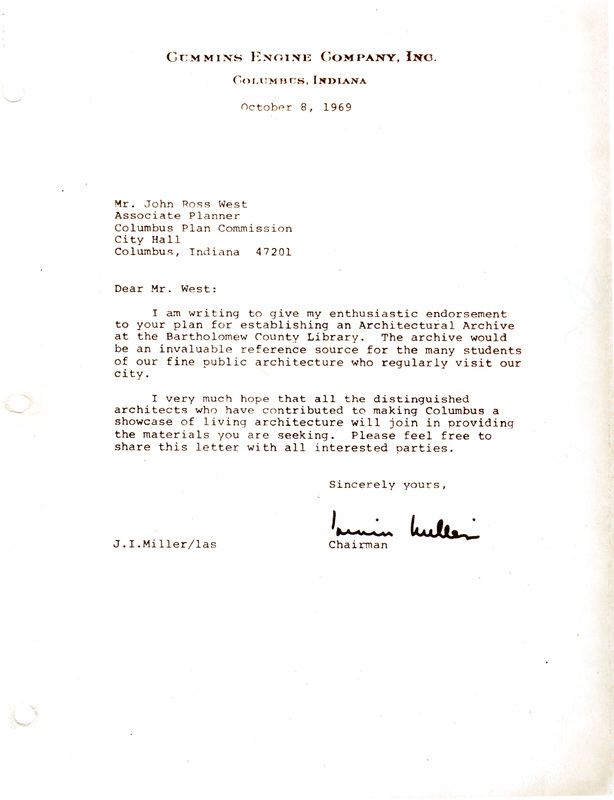 ​Miller wrote a letter to lend support to the architectural archives. This letter was used to solicit collection materials from national architects who had designed buildings in Columbus. The growing collection was housed in the Bartholomew County Public Library, and for many years library staff maintained the archives and provided public access to it. Since its founding, the archives has relied on its community partners to fulfill its mission. These partners include Bartholomew County Historical Society, Bartholomew County Public Library, Columbus Area Visitors Center, and Indiana University-Purdue University Columbus. Without the work and dedication of our founding partners, the CIAA would not be what it is today. 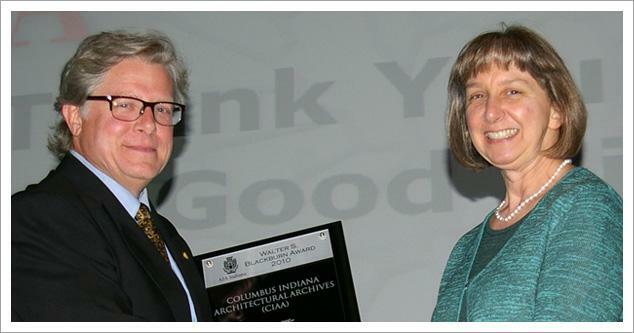 Under the leadership of community activist and former City Council member Lynn Bigley, the Columbus Indiana Architectural Archives was reorganized, and in 2005 it became a 501(c)(3) nonprofit organization. In 2018, the Bartholomew County Public Library became the steward and owner of CIAA's archival collection. The Columbus Indiana Architectural Archives maintains its status as a 501(c)(3) nonprofit organization and supports the work and mission of the archives. Former CIAA board president Rhonda Bolner accepting the Walter S. Blackburn Award from Bruce Race, FAIA, Principal of RACESTUDIO.